Perhaps the last time biology had it together, at least in the public eye, was on June 26, 2000, when Human Genome Project director Francis Collins and Celera Genomics founder Craig Venter joined President Bill Clinton in the White House to declare the draft sequence of the human genome complete. “Without a doubt, this is the most important, most wondrous map ever produced by humankind,” declared Clinton. “Today, we are learning the language in which God created life.” It was a triumph more than a decade, some dozen institutions, and a thousand scientists in the making. Just as importantly, the Human Genome Project represented the fulfillment of an entire biological paradigm—the field of molecular biology—that had begun in 1953 with the discovery of the structure of DNA. That was then, and this is now. Welcome to the post-genomic age. The idea of the human genome is obsolete: hard on the heels of the Human Genome Project came the International HapMap Project and then the 1000 Genomes Project, each aiming via its successively more sophisticated technology to assess and record the range of human variation. Genomes are relatively cheap—about $1,000 for yours or mine—but even one genome per person may not be enough. It’s fashionable now to speak of multiple genomes in a single individual, generated by mutations that occur as the body’s cells grow and divide. And genomes aren’t enough: everything has an “-ome” these days. The epigenome, proteome, microbiome, metabolome, connectome, interactome—each vies to be the next new scientific thing to set the public imagination on fire. Out of this post-genomic landscape comes Evolving Ourselves: How Unnatural Selection and Nonrandom Mutation Are Changing Life on Earth. Venture capitalists Juan Enriquez ’81, M.B.A. ’86, and Steve Gullans, formerly a professor at Harvard Medical School and Brigham and Women’s Hospital, present a fast-paced, conversational collection of dispatches from biology’s frontiers. Captured in the book’s title is its thesis: more than ever, human beings are both agents and subjects of biological change. Darwin is dead, and with him the forces of natural selection and random mutation that built all life on earth. Instead, the authors articulate a new biological order, founded on two principles: unnatural selection and nonrandom mutation. In the first, humans alter their environment through civilization: the plant and animal domestication that Darwin recognized as artificial selection has been followed by industrialization and now modernization. Agriculture has rearranged ecosystems and propelled select species across the planet, and anthropogenic chemicals have found their way into all the earth’s water and air. Human activity exerts subtler selective pressures as well: minimum-size requirements on fishing have shrunk sardines, and city-dwelling mice and voles develop bigger brains than their rural cousins. “Unnatural selection” is too dramatic a term here—the fish and rodents are still products of Darwinian evolution—but the authors seek to evoke agency. The biological world, they argue, is increasingly one of our own making. This expanded agency is at the core of their second theme, “nonrandom mutation,” in which humans alter life more or less at will. Much of the book consists of a paean to bioengineering’s potential (Enriquez is a TED all-star, and it shows). Synthetic organs—skin, bladder, teeth—are gaining in sophistication, and CRISPR-Cas is the latest technology to make it easier to modify our genes. Meanwhile, biology intrudes on identity: hormone treatments alter emotions and blur distinctions between the sexes, and in rats, simple memories can be triggered using pulses of light. The field of synthetic biology aims further still, toward a sort of reversal of time (see “Synthetic Biology’s New Menagerie,” September-October 2014). Its most audacious, or at least most vocal, proponents imagine “de-extinction,” using large-scale DNA synthesis to bring extinct species—the passenger pigeon, the woolly mammoth—back to life. Autism is hardly alone, they add. Various other diseases—obesity, allergies, depression—are on the rise, less-welcome products of the technological progress that has brought about immense lifestyle change, propelling old bodies into a new world. Consider antibiotics. Since their introduction in the mid 1900s, they’ve saved millions of lives, yet recent research on the microbiome prompts caution about all-out antimicrobial assault. Our body’s resident microbes have important roles to play. They digest nutrients, fend off would-be invaders, and produce chemicals necessary for bodily function. Antibiotic use may in fact be linked to obesity: farmers have long fed their animals low doses of antibiotics to promote weight gain, and it’s possible that humans experience similar effects. These scattered anecdotes form a cross-current to the authors’ breathless techno-optimism, and in the chapter “A Perfectly Modern Pregnancy,” the book gives a far more familiar—and telling—snapshot of biotechnology today. When Gullans’s expectant daughter asks her father for medical advice, he and she dive into murky waters. Smoking is out, as are most prescription (and recreational) drugs, but right around there, the clear advice ends. A balanced diet is important, but nutritional supplements may be too much. Genetic testing is by and large a no, and likewise analysis of the baby’s the epigenome and microbiome. “The methods for analysis aren’t robust enough,” the authors write, “so the data remains difficult to interpret, leading to more confusion and worry than anything….” Space colonization remains intellectual light-years away. These discrepancies between current research and its imagined possibilities are not mere pedantry; on technical points, the book is meticulously cited and largely correct. 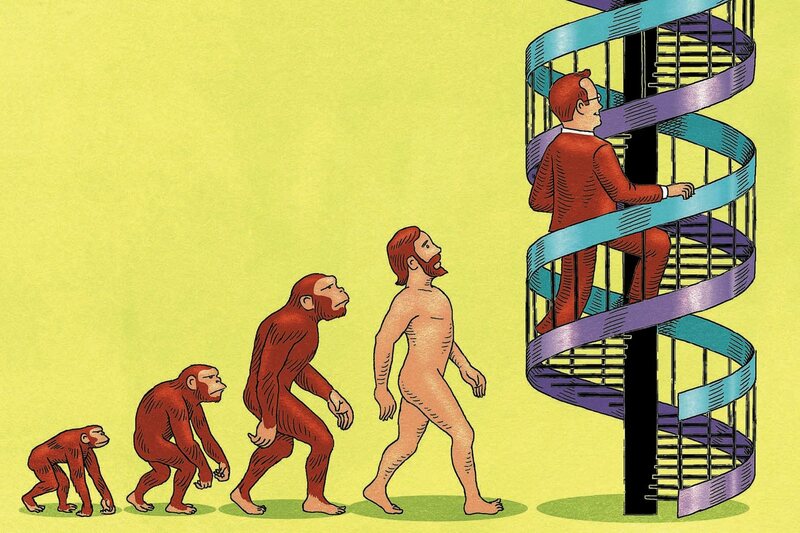 Still, Evolving Ourselves is best read as a book of tall tales from biology’s Wild West. Its stories begin in scientific truth but swiftly shape-shift into myth. Clones, cyborgs, designer babies—as dreams and nightmares, they have been with us for decades, always at the edge of the biological horizon. They are our society’s technological visions, ghost stories of Biology Yet to Come. From the same scientific beginnings, the authors could have chosen different stories to tell. Sequencing the human genome took more than a decade, and beginning to interpret it will take much longer than that. It is easier than ever to read and engineer DNA, but it remains dauntingly difficult to engineer biology, and the two should not be confused. Enriquez and Gullans note that as soon as researchers began scouring the human genome for genes that influence health and disease, they ran up against the problem of so-called missing heritability. Height, for instance, is estimated to be 80 percent genetic, but as of last year, the nearly 700 hundred genes identified in connection—through genome-wide studies of a quarter-million individuals, no less—account for about one-fifth of that effect. Former associate editor Katherine Xue ’13 is a graduate student in genome sciences at the University of Washington.